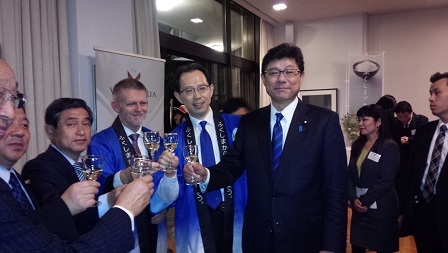 On 11 November 2015, Minister Takagi and State Minister Wakamatsu joined the reception for tasting New Zealand wine and sampling Fukushima food at New Zealand Embassy in Tokyo. This event was co-hosted by Embassy of New Zealand and Fukushima Prefecture, in support of producers from Fukushima Prefecture, suffering from harmful rumor after the nuclear accident. By serving Fukushima’s fine agricultural and marine products in collaboration with New Zealand wine, the event was aiming at promoting Fukushima products. Participants enjoyed the flavor and reaffirmed the safety of Fukushima products.